Star Wars Miniatures: Revenge of the Sith Set Sneak Peek 2! The Star Wars Episode III Revenge of the Sith [kwlink]movie[/kwlink] drops in May, 2005, but you can get a handful of previews of the characters in the movie with the [kwlink]Star Wars Miniatures: Revenge of the Sith[/kwlink] game on April 2, 2005. 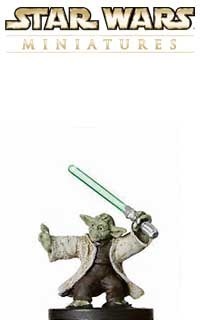 You can also check out our sneak peek [kwlink]previews[/kwlink] of the game, including Yoda, Jedi Master, a Wookie Berserker and more, right here! Just click the pictures for bigger images. Unique - You can't have more than one of this figure on your team. Melee Attack - (Can attack only adjacent enemies). Triple Attack - (On his turn, this character can make 2 extra attacks instead of moving). Force Defense - (Force 3, Cancel a Force power used by a character within 6 squares). Force Valor - (Force 2, For the rest of the skirmish, this character gains the following Commander Effect: Followers within 6 squares get + 2 Attack and +2 Defense). Lightsaber Deflect - (Force 1, When hit by a non-melee attack, this character takes no damage with a save of 11). 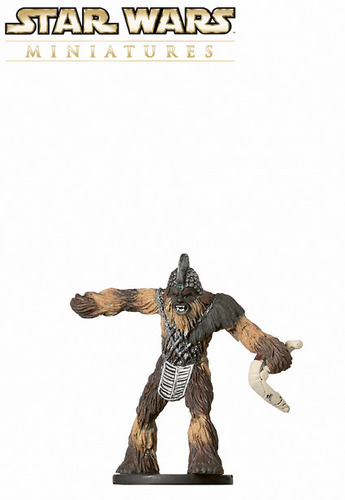 Allied Wookiees within 6 squares gain Bodyguard (If an adjacent ally would take damage from an attack, this character can take the damage instead). Momentum - (If this character has moved this turn, he gets +4 Attack and +10 Damage against adjacent enemies). The 'wee green dude is a tiny little ball of Force power! Unlike [kwlink]Grievous's Wheel Bike[/kwlink] which is all about blasting enemies at range, Yoda is an in-your-face fig who's perfect in a team full of Wookies. 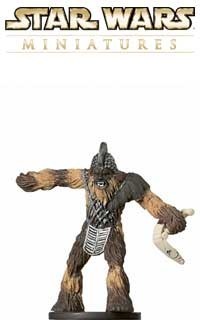 Charge him into battle with a pack of powered up Wookie Berserkers to help spread the damage around and keep the whole gang fighting longer. We have the rest of our Revenge of the Sith set previews at these links, check 'em out! 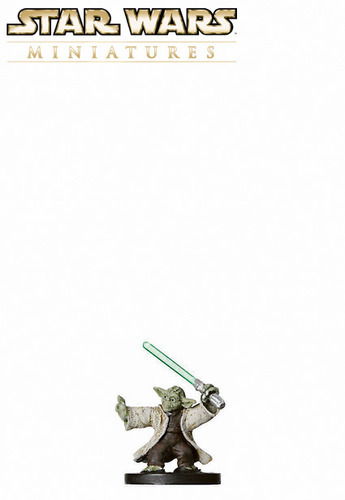 Enter to Win Free Star Wars Miniatures Toys! Get More Star Wars Game News Here! What's in the Wookie's Hand? I think it's a banana. Is it a droid head?